Halloween was fun. Me and the pre-teen carved pumpkins and she had a big gang over for japes and trick or treating. I went to the pub with my bat wings on. Over a Helmut Lang jacket. I’m not completely mad. One of my daughter’s friends is a very nice boy called Deckie. His father is Balinese and I was chatting to him about that beautiful island, then on his way out of the kitchen he stopped and looked at two of my favourite paintings which are hanging there. ‘These are nice paintings…’ he said and I started telling him how they are among my very favourites of all the paintings I own and how I came across them at the summer exhibition which is held in Rye (where he and Peggy go to school) every summer. It turns out the artist, Lorna Vahey, is his grandmother. I love her work. It’s very small and detailed and has a dream-like, very narrative quality. All her paintings have titles. 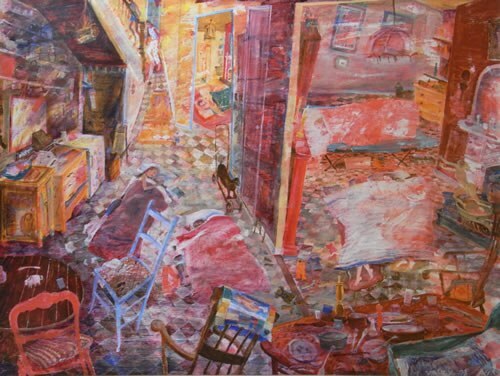 I have ‘The Nuclear Cafe’ which is about her time as an anti-nuclear protester and ‘The Room With the Biscuits’. 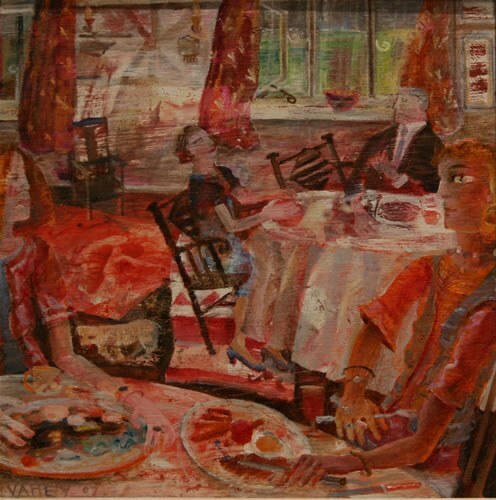 If would like to look at more of Lorna Vahey’s work, she is on this site ,where I found these images, which are called ‘A Dinner near Geoffrey’ (above) and ‘The Dormitory’ (below). PS After watching three more episodes of Breaking Bad last night, I’ve decided to give up on it. Yes, it’s brilliant, but it’s so dark. I really don’t need that in my head. I love these paintings – a bit Chagall. And I know what you mean about Breaking Bad – it is excellent; but not something you want lurking in your thoughts.